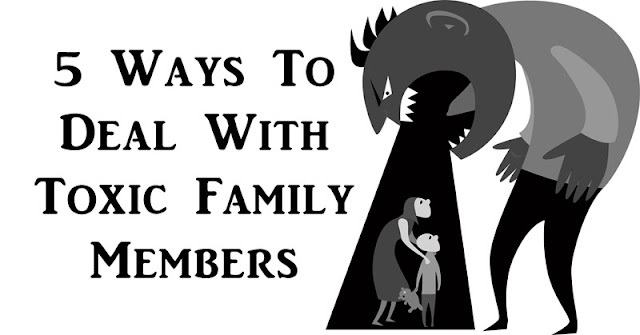 A while back, we shared 4 things everybody needs to know about toxic family members. In this continuation of sorts, we’ll be looking at ways to actually deal with said family members. Because let’s face it – as nice as it would be to just shrug their toxicity off and go about your life, these things tend to wear at you over time. And if you’re not careful, you could wind up exploding and saying or doing things that lead to some pretty awkward family dinners down the road. Here are 5 ways to avoid that. Think back to elementary school. You remember that bully who poked at any and everyone? Your toxic family member is exactly like that. They’ll make anyone (not just you) feel bad about themselves. Maybe they’re doing it to get something. Maybe they’re just plain mean. Whatever the reason, it’s all got to do with them. Use your toxic family member’s attacks as opportunities to practice the art of not taking things too personally. If you can master it in that relationship, you’ll have a much easier time applying it to interactions with non-family members as well. When you’re ready, approach your family member and assertively (not aggressively) communicate your distaste for the way they’ve been treating you. The aim here is not necessarily to change their behavior. As nice as that would be, the truth is that their behavior is not yours to control. What is yours to control? The way you react. By pretending everything’s okay when your family member walks all over you, you’re sending the wrong message – one of weakness. Show your strength and let them know you’ve very aware of what proper treatment is and you won’t settle for less. Most of us have a soft spot when it comes to family members – even toxic ones. We don’t like to make them face the music. But look. In life, there are rules. Until your toxic family member starts treating you with the regard one would expect from a family member, don’t feel bad about showing them that every action has an appropriate reaction. Say your family member physically abuses you. The natural consequence in that circumstance is legal action. Say they damage your property and refuse to pay for the damage. Guess what – you’ve got legal grounds there too! Surrounding yourself with positive people is key to remaining confident as you wrestle with your toxic family member. This is particularly true if that family member is someone like a parent who has been treating you poorly for as long as you can remember. Assuming you’re an adult, take advantage of your freedom and spend as much time with your positive, encouraging friends as possible. They’ll show you what respect looks like and teach you that you do deserve proper treatment. The longer you spend walking around with hate and rage for your toxic family member, the more they win the war. That doesn’t mean you should just toss all negative feelings about them into the wind, though; after all, those feelings instill protective caution. What you need to do is forgive while simultaneously keeping in mind the nature of your family member. Let go of your desire for vindication or revenge and turn it into a desire to protect yourself and others from future attacks. Have a look at this video from Ben Leichtling, president of Bullies Be Gone, to learn more about dealing with toxic family members – particularly parents.